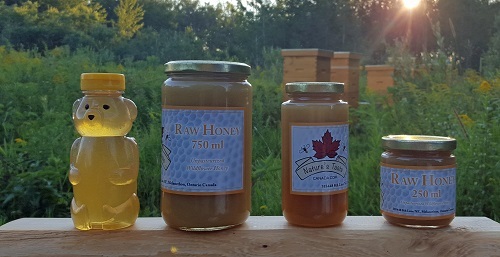 natural maple and honey products. Birch syrup is a savory mineral tasting syrup made from the sap of birch trees, and produced in much the same way as maple syrup. It is seldom used for pancake or waffle syrup, more often it is used as an ingredient paired with pork or salmon dishes in sauces, glazes, and dressings, and as a flavoring in ice cream, beer, wine, and soft drinks. It is condensed from the sap, which has about 0.5-2% percent sugar content, depending on the species of birch, location, weather, and season. The finished syrup is 66% sugar or more to be classified as a syrup. Birch sap sugar is about 42–54% fructose and 45% glucose, with a small amount of sucrose and trace amounts of galactose. The flavor of birch syrup has a distinctive and mineral-rich caramel-like taste that is not unlike molasses or balsamic condiment or some types of soy, with a hint of spiciness. Different types of birch will produce slightly different flavor profiles; some more copper, others with hints of wildflower honey. 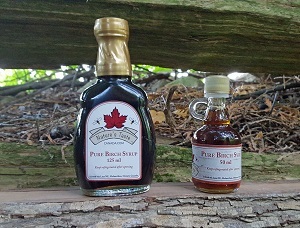 Many people remark that while Birch syrup has the same sugar content of maple it is far more savory than sweet, Order yours today! 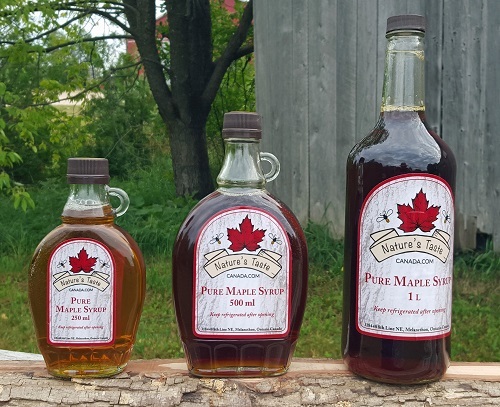 Maple syrup is a syrup usually made from the xylem sap of sugar maple, red maple, or black maple trees, although it can also be made from other maple species. In cold climates, these trees store starch in their trunks and roots before the winter; the starch is then converted to sugar that rises in the sap in late winter and early spring. Maple trees can be tapped by drilling holes into their trunks and collecting the exuded sap, which is processed by heating to evaporate much of the water, leaving the concentrated syrup. Maple syrup was first collected and used by the indigenous peoples of North America, and the practice was adopted by European settlers, who gradually refined production methods. Maple syrup is often eaten with pancakes, waffles, French toast, oatmeal or porridge. It is also used as an ingredient in baking, and as a sweetener or flavouring agent. Honey is a sweet food made by bees foraging nectar from flowers. The variety produced by honey bees (the genus Apis) is the one most commonly referred to, as it is the type of honey collected by most beekeepers and consumed by people. Honey is also produced by bumblebees, stingless bees, and other hymenopteran insects such as honey wasps, though the quantity is generally lower and they have slightly different properties compared to honey from the genus Apis. Honey bees convert nectar into honey by a process of regurgitation and evaporation: they store it as a primary food source in wax honeycombs inside the beehive. Copyright © 2019 Nature's Taste Canada. All Rights Reserved.